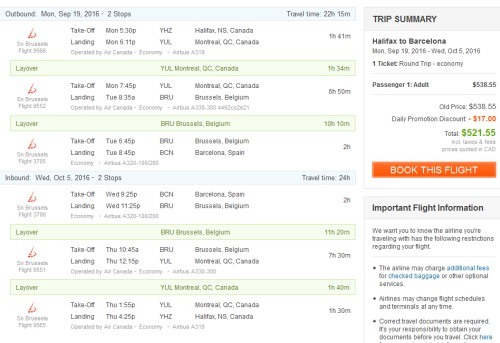 KLM, Air France, and Delta dropped their prices from Halifax to virtually everywhere they fly in Europe, Tunisia, and Morocco down into the range of the $300s to $600s roundtrip including taxes today. The list of destinations below will continue to grow. Refresh the blog post for the latest. If it's on the map above, it's probably on sale. It may also be possible to book some of these through the current Flight Centre promotion for $100 CAD off of international flights, for some *really* amazing prices. See details below. Mostly October, November 2016, but also some in September, and in January, February, March 2017, depending on the destination. In Europe, you may want to focus on the destinations that are further south, as the weather will still be warmer in the fall. 2. Click through to Air France or KLM for booking. These can also be found on ITravel2000 or Flight Network or FlightHub or Expedia and countless other booking sites. - No blackout dates. Valid for any airline. It's generally possible to get a free stopover in Amsterdam using KLM, or in Paris using Air France. 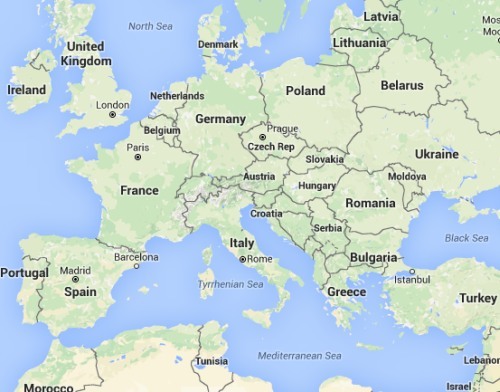 Below are some more destinations in Europe that *may* be available in the $500s to $700s roundtrip including taxes. It's overwhelming to list them all, so I've focused on destinations that are either further south in Europe (warmer in September, October, November), or just popular places in general. It's impossible to verify that the prices are bookable for every destination. Have a look on Google Flights, and try booking either from Google Flights to the airline's website, or through the third party booking sites mentioned below:. (Even when Google Flights can't seem to find a way to book it for the displayed price, it's worth trying the booking sites above, as they may be able to). In some cases, the flights may be through British Airways, with a change of airport required, so watch out for that. Clicking on a destination will take you to a Google Flights search. Open the calendar to view other dates. Still seeing the low prices to Europe, Tunisia, and Morocco today. It's worth trying Expedia, FlightHub, FlightNetwork, ITravel2000 or Momondo, even when Google Flights doesn't provide a booking option. The Star Alliance (Air Canada, Lufthansa, etc) started matching prices yesterday evening. You can try setting the 'Star Alliance' filter in Google Flights to see what's available (it's under 'Airline'). Spain, Portugal, Greece, and Croatia have been the most popular choices to book with this deal.